At first I thought to open the review by stating that I don’t really like mobile games, but that is not entirely accurate. I do actually own 64 apps on my iTunes account, perhaps not all that much considering I have had one since they were first introduced, but not a small number either. At least 75% of those apps are games, which surprises me a little. But when I looked over which games I had, a pattern definitely emerged. The only games I really spent any significant time playing were all full games that you could purchase outright. Even then, I tended to play them a lot less than I would on a Nintendo 3DS, or especially my beloved PS Vita. So what I decided would be a more accurate statement is that it’s not that I don’t like mobile games. The controls are not my favorite, but what I really don’t like is Free to Play mechanics. A few new faces and many old. So even with the Final Fantasy title, possibly my favorite video game franchise of all time, this game had an uphill climb ahead of it in order to garner my affection. Just because the game has Final Fantasy in the title, and is published by Square Enix, doesn’t necessarily mean it’s a true Final Fantasy game. 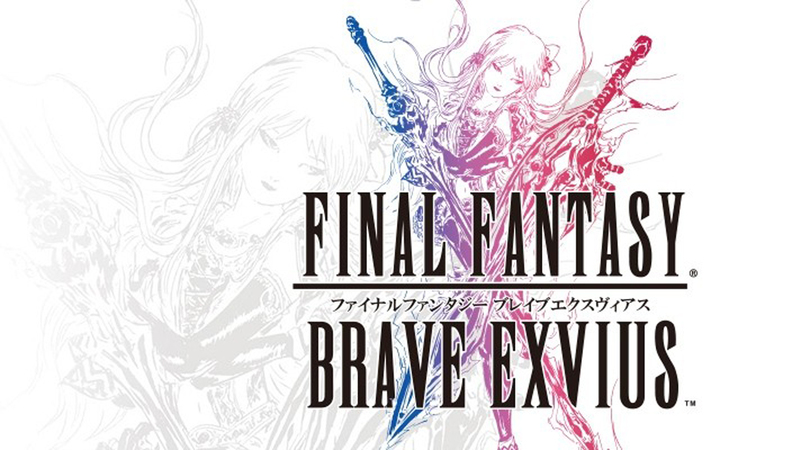 The Brave Exvius in the title is an important distinction to make because this was developed by Gumi Inc., the makers of the very popular Brave Frontier FTP mobile game. I never played that game personally but it certainly looked pretty, and it garnered quite a few fans. So this game was the two companies combining their efforts to make that style of game featuring a Final Fantasy world and characters. Rain is a fairly common JRPG protagonist; a bit irresponsible and some serious daddy issues. The main character is Rain, and he is fairly young to be a knight of Grandshelt. He seems to have a deep reserve of power, but he also definitely leads with his emotions first. So far, I actually like him a little better than many recent Final Fantasy protagonists. Even with his father issues, he does not come from the school of ‘grimdark’ heroes that many of his predecessors did. 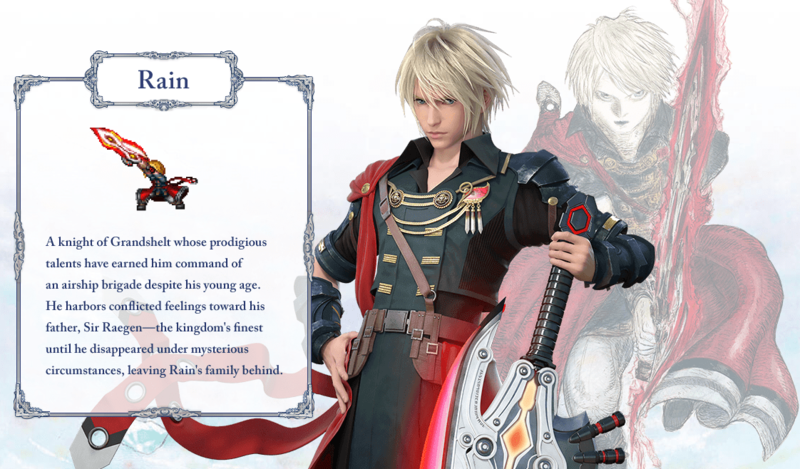 Despite his official artwork that makes him look like a character from Final Fantasy Type-0, he wears his emotions on his sleeve and considers himself a bit of a Lothario. 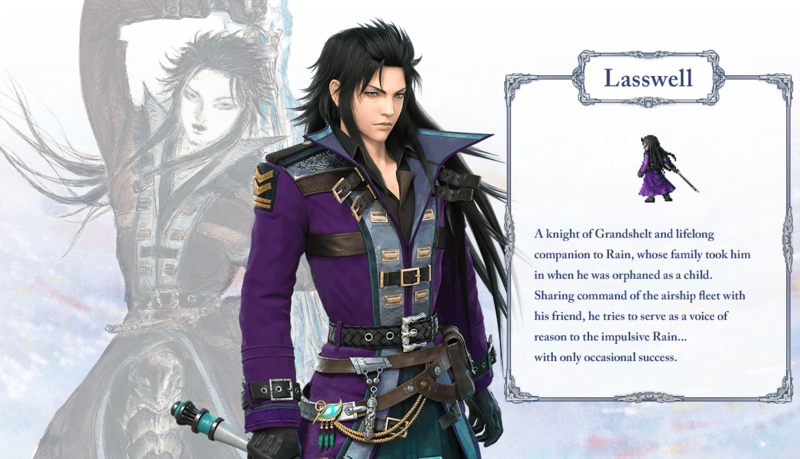 Lasswell is Rain’s lifelong friend and confidant. In many ways Lasswell is Rain’s opposite. But in the rare circumstances that he lets his guard down, you can tell that Lasswell is mostly so serious because he needs to be in order to keep Rain in check. He is perhaps overly serious and highly accomplished, but you will see deeper into his personality over time. Much of what you find is actually a low sense of self worth and a few well guarded secrets. Your standard damsel in distress this round is Fina. Fina takes the roll of princess who needs to be saved for this game. 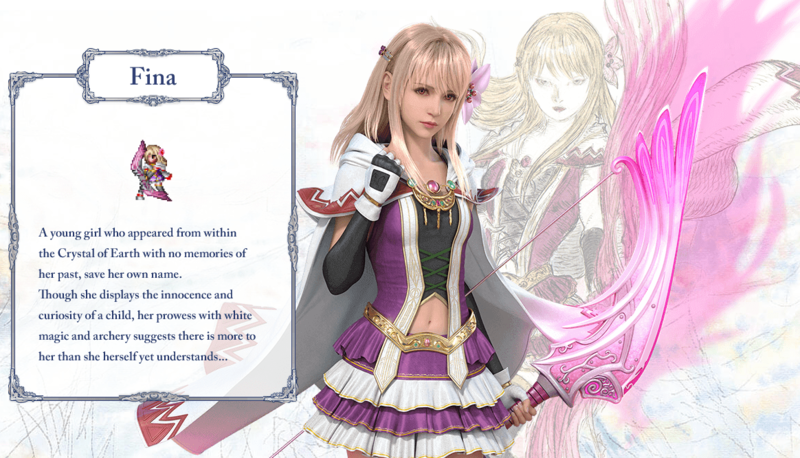 She is a bit of a RPG trope with her amnesia and appearing from a crystal and using a bow and white magic. However, it’s not always a bad thing to go with the classic archetype. If she was obnoxious it would not work out, but she’s rather sweet and innocent and is generally a fun character to be around. As a white mage, she will often be a very important party member unless you can happen on a better one through the luck of the draw. Character selection and growth is the highlight. 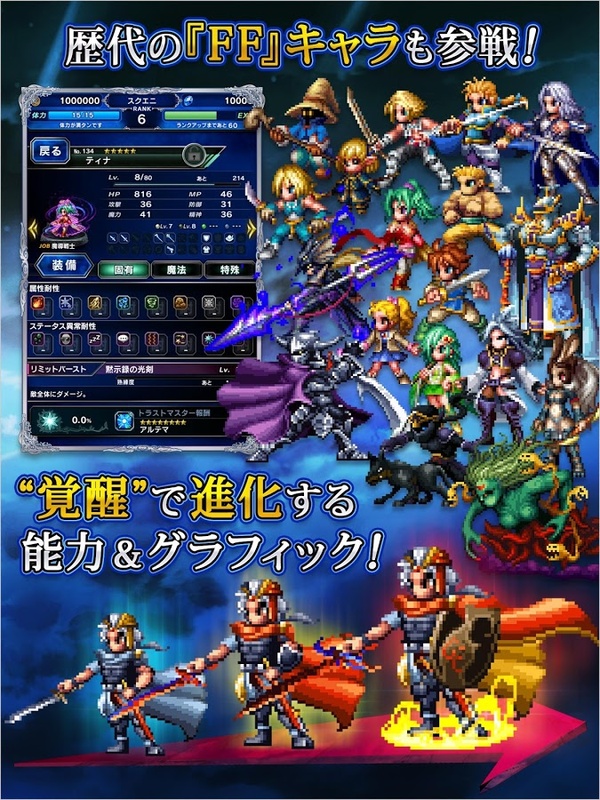 There are a couple more story characters that you will run into and eventually be able to recruit, but they are not really the focus of the game. The focus is in having many different characters, 90% of which come from classic Final Fantasy games, that you can mix and match into the party and grow in level and rarity. You can perform a character summon by using Lapis (the common currency of the game for almost everything important), friend points, or the very rare summon tickets. 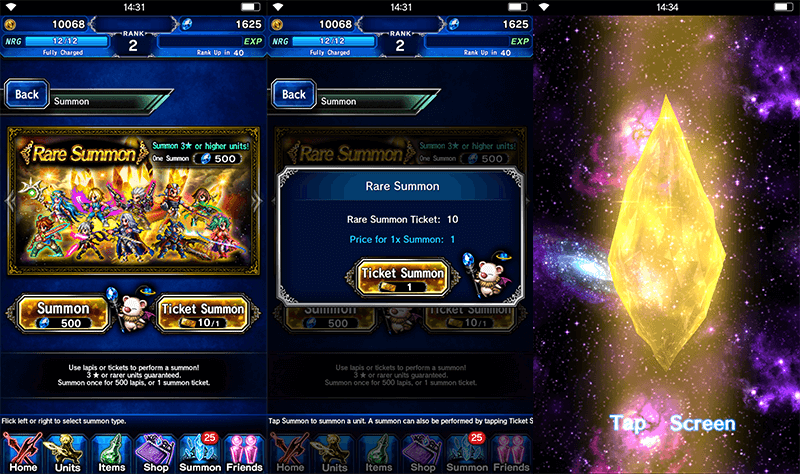 Much like many other FTP titles you have a smaller chance to summon rare characters than you do low rank ones. But in this game you can spend a lot of time and resources in increasing the rarity of those characters. Gold summons are rare, rainbow colored ones are extremely rare. The Rank (between 1 and 6 stars) determines the quality of spells and skills available to them, their base statistics, and the potential level that you can raise them. 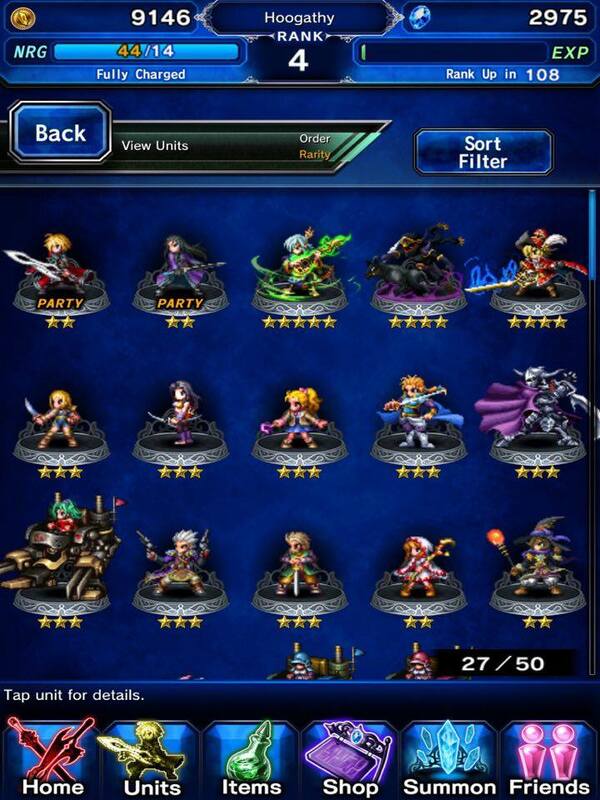 For a 1 star character, you can only level them up to 15, but for a 6 star you can level them up to 99. Unfortunately, so far it seems that you can only gain 6 star characters from extremely rare summons. You cannot actually raise any character’s Rank past 5 stars through Awakening. Sadly each time you awaken them to the next rank, they start at level 1 again, but at least they keep all their spells and skills from the previous rank. This randomness in characters, and the fact that spending a load of cash on Lapis for summoning purposes will net you better characters, does not endear this method to me very much. But there is a lot of satisfaction in growing your characters, almost like Pokemon, especially for the classic Final Fantasy characters like my Rydia (who is now Rank 5). Town and Environment Exploration involves the use of a virtual stick. Your time in the game will be spent between Rounds of combat at a location, Exploration at a location, Exploration in a town, Rounds at the Colosseum, or Rounds/Exploration in the Vortex. Most of your progress in the story will work its way across the overworld map via defeating dungeons using multiple Rounds of combat until you defeat the boss of that location. Sometimes after you defeat that boss, the location will then be open for Exploration which will seem much more like a traditional RPG with the hidden passages and treasure as well as random combat. The Vortex is also much the same, only it features special zones that you can either defeat to gain special rewards or there will be special timed events (such as the one for Halloween). All those activities use up your Energy meter, as you would expect for a FTP game, and you need to wait for it to restore over time or purchase more energy with money. Colosseum rounds do not expend energy, but they are limited with the number you can participate in before they have to build back up over time. The touch command combat is pretty good. The actual combat is pretty fun, especially if you are like me and love the old turn based style of RPG. This is a style that has been largely left behind by many developers because it’s considered too archaic. But I still love the old style, and this game does it very well. If it was just the combat and I could play all I wanted without restrictions, I would give this game a glowing review. But unfortunately it is like other FTP games and it actively undermines your effort to play it. 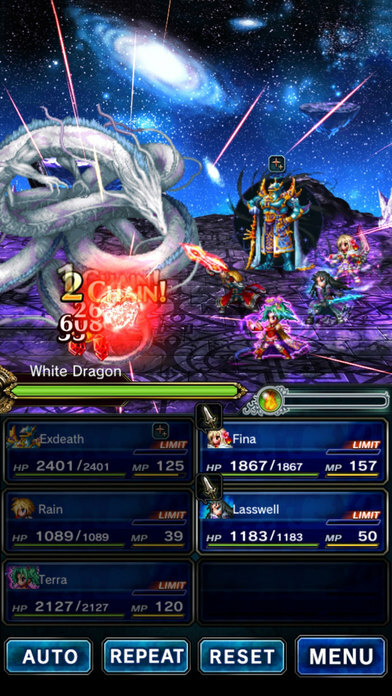 The Energy in this game is even more restrictive than other FTP games that I’ve played, such as Final Fantasy Record Keeper, and the Energy restores at an even slower rate. So most of my time “playing” this game has actually been not playing it, waiting for my energy to come back. If they would just allow me to spend the $20-$40 and just buy the bloody game, I would really like it. The art design is quite good. 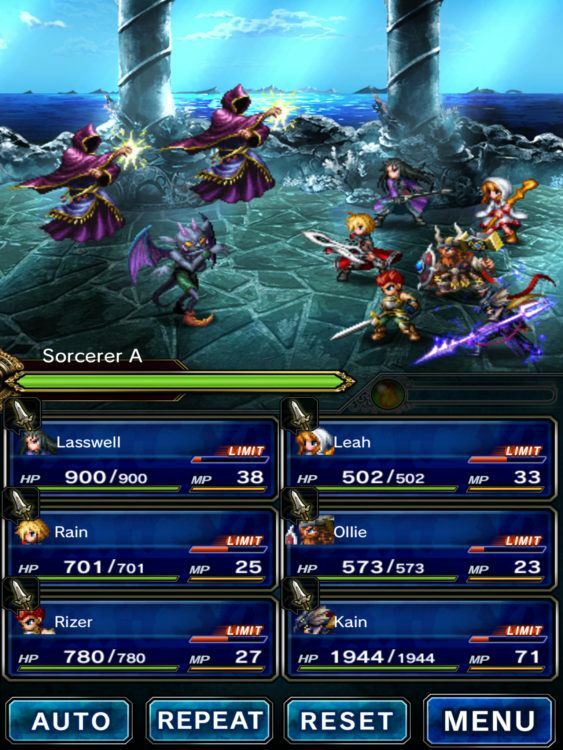 The art design of the game is very good, especially the full motion video summon spells (a Final Fantasy staple that is utilized very well here). So I really would have loved to spend more time just enjoying all that beauty instead of being forced to not play. The music is also really stellar and holds up to any mainline Final Fantasy game. The story is good so far, but I am reviewing this game while content is still being released for it. The game has only recently come out worldwide but it’s been out in Japan for over a year and the content is still coming out. That is a good sign that you can play this game’s story for quite a while yet. But because the game is so beautiful and large (for a mobile game), make sure you have a good device to run it. On my iPad 3 it got a bit sketchy after a while and crashed out. Thankfully it saved my progress and it was quick to get back in. So the only real points I’m taking off is because I don’t like the FTP mechanics. They are a bit predatory and stand in the way of actually enjoying the game. Other than that, there is really no reason for you not to pick up this free game and give it a spin. 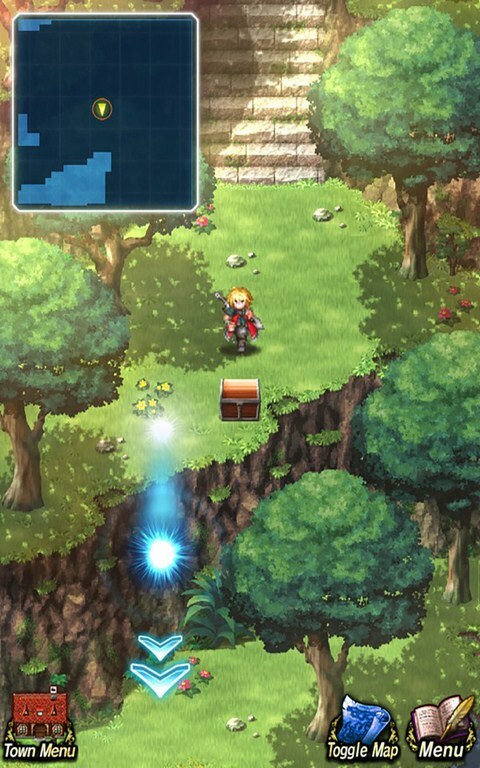 There is a lot here to recommend, especially for fans of the classic Final Fantasy games.